Prompted by a father’s petition for help in euthanizing a child born with a deformity, Hitler authorized his personal physician Dr. Karl Brandt (1904-1948) and the head of his Chancellery Phillip Bouhler (1899-1945) to introduce the so-called Children’s Euthanasia in early 1939. This authorization was probably given only verbally. At least 5,000 children and infants with hereditary diseases or physical and mental disabilities fell victim to this state-organized killing initiative. In July of the same year, Hitler asked Brandt and Bouhler to develop a similar program for adult patients, a program that would eliminate “life not worth living.” The true implications of this secretive, state-organized murder program, which stood within the framework of Nazi racial “enhancement,” were concealed behind the euphemism “euthanasia” as voluntary suicide. 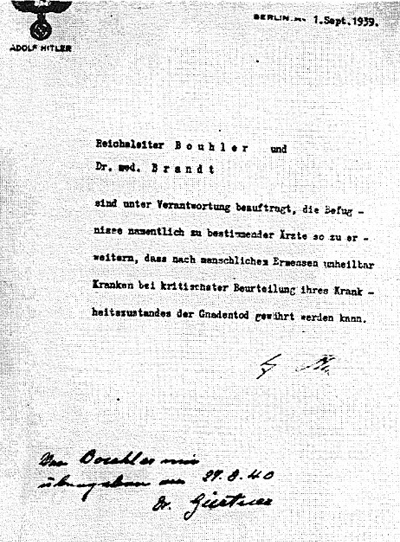 The following missive, which Hitler signed in October 1939 and backdated to the beginning of the war, constitutes the official written authorization for Bouhler and Brandt to carry out the program of murder. Reichsleiter Bouhler and Dr. Brandt, M.D. are charged with the responsibility of enlarging the authority of certain physicians to be designated by name in such a manner that persons who, according to human judgment, are incurable can, upon a most careful diagnosis of their condition of sickness, be accorded a mercy death. Source of original German document: Auftrag Hitlers an Reichsleiter Bouhler und Dr. Brandt: Bestimmte Ärtzte sind zu ermächtigen, den Gnadentod an Unheilbaren zu vollziehen (zurückdatiert auf den 1. September 1939) (Beweisstück US-342). In Internationaler Militärgerichtshof Nürnberg, Der Nürnberger Prozess gegen die Hauptskriegsverbrecher vom 14. November 1945 bis 1. Oktober 1946: Urkunden und anderes Beweismaterial. Pubished in Nuremberg 1947. Munich: Delphin Verlag, 1989. Volume XXVI: Amtlicher Text – Deutsche Ausgabe, Nummer 405-PS bis Nummer 1063(d)-PS. Document 630-PS, p. 169.